Last week I wrote about belatedly learning how container image manifests work. My motivation was, in part, in order to try to prototype this mechanism. With thanks to Daniel and Neil for helping educate me on DAML. Hoogle is a Haskell search engine, geddit? I’m a DAML neophyte and I’ve (not|never) used Haskell. I find DAML to be “unusual” but I’m able to achieve my economical goals using it. 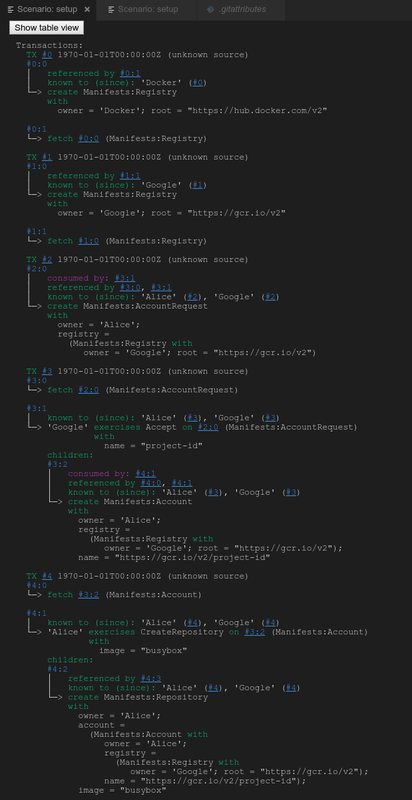 I wrote the sample referenced in this post in a couple of hours this week and spent the majority of my time, scratching around docs.daml.com to recall syntax and to find functions (e.g. lists). In a spirit of learning by teaching, and teaching by helping others with my mistakes, I’m going to summarize my challenges here in building this sample. The DAML SDK works excellent with Visual Studio Code. I’m generally in need of software help particularly for code completion, signature help etc. As I “build a relationship” with DAML, the Code integration is wonderful. I don’t grok why I must reproduce the ‘type’. Runtime errors guided me to adding the deriving (Eq,Show) and I suspect (!) that e.g. Eq works because it’s the same as equality on Text but… magic. 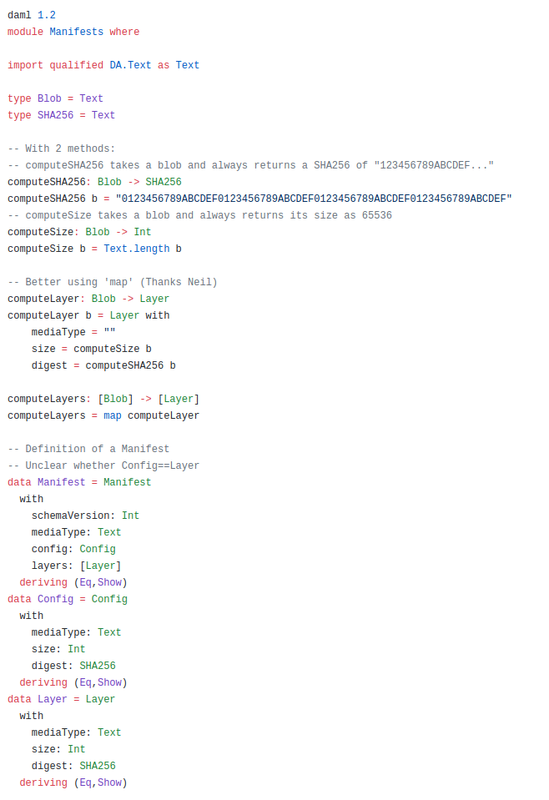 And that there will be a foundational type of “SHA-256” in the SDK. Which I was proud of ;-) computeLayers takes a list of Blob and returns a list of Layer. It’s defined as, not much on an empty list () and recursively applies the implicit function mapping a Blob to a Layer for any other list. With an explicit definition of computeLayer and its list variant as being simply map computeLayer. I’m still slightly ‘fragile’ about when to use template versus data. Intuitively, I seem to pick the correct one but why data manifest but template image is difficult to articulate. Perhaps it’s that Templates are primarily ledger-resident entities because they can be create’d and other Verb’d? That continues to be quirky to my eyes. There’s Pythonesque indentation requirements too that invariably cause me to shift blocks of statements in|out until the syntax checker stops complaining. The editor detects scenario do in your source and provides clickable Scenario results that takes you this view wherein you can determine the Contracts (Templates) that are created and archived using both a (more useful) transaction view and a table view. The syntax for scenarios has changed between DAML versions and it took me a little while to get my head around the new syntax but it’s relatively straightforward. The ambition here is to emulate instantiating Contract (Templates) and applying methods to them. The tooling is able to identify errors in your code (you can’t send money to dead accounts, for example) and you can’t perform actions unless you’re a signatory. It’s likely good practice to start a prototype by writing (or having someone write for you) the tests that you wish fulfilled and *then* writing the implementation. In this example, short of creating their own Registry, Alice must submit an AccountRequest to a Registry owner and only the Registry owner can approve the request thereby creating an Account for Alice to use. Commonly, scenarios would include assertions that, you often can’t spend more money than you have or sell things that you don’t possess. If you’re familiar with Haskell, you probably didn’t read this far as this is obvious to you. If you’re unfamiliar with Haskell and DAML, I encourage you to explore the language using the excellent SDK if you’re interested in developing formal solutions to workflow scenarios particularly smart contracts. For me, DAML isn’t an intuitively obvious language but, then again, I’ve not used anything else that provides the same rapid development and controls for solutions in this domain. A possible next step for me is to rewrite this solution using a more familiar language (e.g. Golang) to see which is more productive and which is more accurate. The DAML SDK is excellent and the documentation (including Hoogle) are comprehensive.